Do I have time and energy that having a pet takes? Do I have space to house a pet, and if so, what size and type of pet should I choose? Am I away from home for long periods of time? Do any members of my family have allergies that could be effected? Add any other points here that could effect your decision, now lets look at each of these points in more detail. Do I have time and energy that having a pet takes? So lets say you’re in your twilight years, perhaps a horse, or a St. Bernard might not be the right choice for you. But lets say you’re a stay-at-home mom, living on a farm or a huge property then these might be a good choice. St. Bernard’s are gentle giants, great with kids, but they need room to roam. A horse needs, feeding, grooming, exercise, but could be a great choice to teach children responsibility, new skills, etc. I think you see where I’m going with the right choice. Do I have space to house a pet? Let’s say you live in a studio apartment; then a cat or small dog may be your preference, if you live in a house, a larger dog could be accommodated; always consider all the options; and make sure if you have children you look for a pet that is the recommended temperament for a child. Am I away from home for long periods of time? So you are in a job or profession where you travel a lot; then maybe a dog is not for you. A dog needs companionship, exercise, trips outside to use the bathroom etc. A cat can be left for a longer period of time, with today’s auto watering systems, and feeding systems, this makes life easier. Or you could hire a pet sitter, but what’s the point in having man’s best friend if you’re not there enough to bond and enjoy your pet. Do family members have allergies that could effect this decision? Hair allergy, pet dander allergy, the list goes on and on. If this is the case perhaps a fish, turtle, or bird is more in the realm of possibilities. So in conclusion, take your time to consider if and what pet would be best for you; remember those cute kittens and puppies do grow up; the biggest mistake people make is falling in love with this cute little critter only to discover months later that they made a mistake, and no longer want this animal. Think long and hard before making a decission you could love or hate for a very long time. Warning, DIY Project ahead! This weekend I decided to get some inspiration from Pinterest and create some fun cat furniture and cat towers out of old bar stools. I created two different styles and used mostly things I had laying around the house to repurpose. Before I even finished the first stool Lulu was already in the hammock with Daphne not far behind! The best thing about these stools is that the humans can still sit on them. The cats took to the sisal rope scratching posts immediately. Gather Supplies: Rolls of Sisal Rope (can be found in the hardware section at Walmart); Staple Gun and staples (3/8″ or 10 mm stapes work best); an old winter scarf or blanket for the hammock; scissors to cut rope and blanket to size; string for attaching toys; toys; glue gun and glue sticks for gluing the sisal rope during the wrapping process. 1. Make the Hammock – Decide where you will put the hammock. I chose the bottom side rungs on one stool and the top on another. Wrap the material around the wood rung and staple it in place. Pull the material tight on the other side and staple. Then cut any remainder. To make the sisal rope seat, I started by laying the stool on it’s side then gluing the sisal to one rung and wrapping the rope around the other rung. Every wrap I applied more glue and ensured each wrap was close to the previous so there wouldn’t be gaps in the seat. At the end I glued the rope to the other end and stapled everything to secure it. 2. Make the Scratching Post Legs – Now decide how many legs you want to wrap. I wrapped two legs on each stool. Lay the stool on its side at a comfortable height. Keep your plugged in glue stick and scissors nearby. Cut enough rope where you can easily bunch it in your hand and hold it for quick wrapping as pictured. Start by gluing the end of the sisal rope to the stool, then apply three or four stripes of hot glue to the sides of the stool and wrap the rope around the glued spots (pictured below). Continue gluing and wrapping until you reach the end of the rope. Glue the end piece to the stool and follow up with the staple gun. Then start again with another piece of rope and glue until you’ve wrapped as far as you’d like to go. Repeat with other stool legs. 3. Attach toys – I used thick string and tied it through the holes in the jingle balls. Then I tied a knot in the top of the string and stapled it to the back of the stool seat just above the knot to keep the string from slipping through the staple. I also used the fringe from an old scarf and attached it to the bottom of the seat for extra enticement. The cats were intrigued the moment I started attaching the toys. Here’s the final product on the second stool. I hope you enjoyed this tutorial! 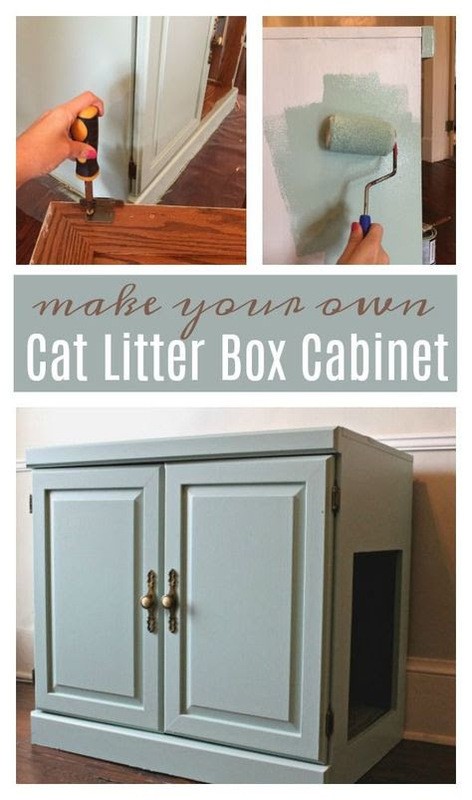 Please share your favorite DIY cat projects with us.